How can more refugees get their voices heard? 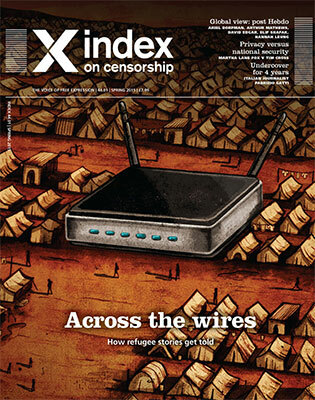 The latest issue of Index on Censorship magazine is out now and features a special focus on the threats to free expression within refugee camps. We follow the steps of Italian journalist Fabrizio Gatti, who spent four years undercover investigating migrant routes from Africa to Europe. We look at how social media has become a blessing and a curse – offering a connection back home and a means of surveillance. We have pieces by refugees, written from inside camps about persisting myths; by those struggling to claim rights as workers; and by those who have set up innovative, creative projects to share their stories. 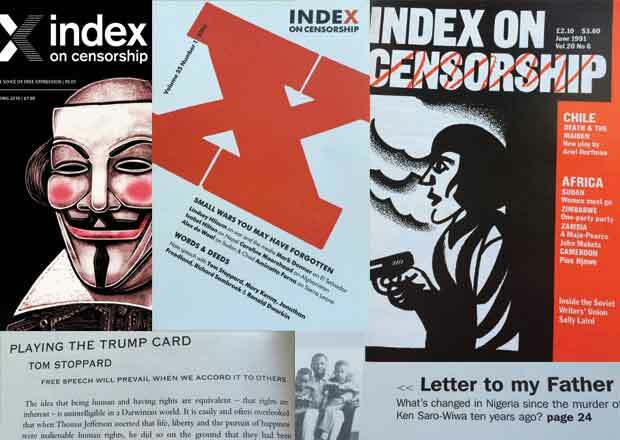 The issue also features a thoughtful analysis of the aftermath of the Charlie Hebdo attack in Paris, with contributions from Chilean writer Ariel Dorfman; Irish co-creator of Father Ted, Arthur Mathews; Turkish novelist Elif Shafak; British playwright David Edgar; former head of BBC news Richard Sambrook; and Hong Kong-based journalist Hannah Leung. Taking the long view, this group of writers looks at the worldwide picture, and how terror is used to silence. Also, Martha Lane Fox and retired Major General Tim Cross go head-to-head, debating if privacy is more vital than national security. We have stories about attacks on journalists covering the drug trade in South America; a cover-up of abortion figures in Nicaragua; and the lessons to be learnt from attempts to downplay epidemics, from Aids to ebola. Plus an extract from Lucien Bourjeily’s new play, which has skirted the Lebanese censors’ ban, and poetry from Turkish writers Ömer Erdem and Nilay Özer – all translated into English for the first time. The issue’s cover artwork is by cartoonist Ben Jennings, and the magazine also features work from our regular collaborator Martin Rowson; and extracts from a graphic reportage set in an Iraqi camp, by Olivier Kugler. Let the world stand up and recognize the basic fundamental rights of all people irrespective of age, gender, race or Country location. Let the world give peace a chance and #uphold free speech for all people.